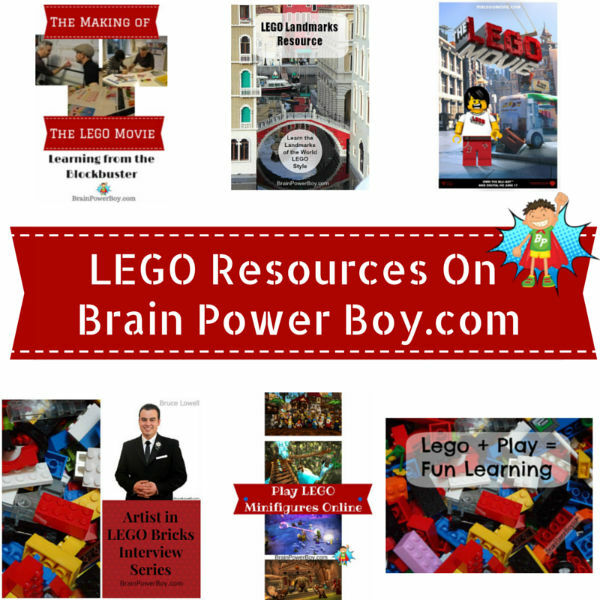 We are big into LEGO here on Brain Power Boy because it is such a big part of our lives! We play with it, and talk about it often (ok, most every day!) When I decided to start this website on boys’ learning I knew this wonderful toy would have to hold a featured spot, and it does. Many boys really enjoy playing with LEGO and there is so much they can learn from doing so. It is not only a great toy but a great learning tool and an artist’s medium as well. It provides so many possibilities for play, creativity, use of imagination, perseverance, logical and spatial learning and more. There is so much you can do with those tiny bricks–simply amazing. I hope you will enjoy this list of all of the articles so far. Be sure to bookmark or pin this because we will continue to add to it over time. You can also sign up for our newsletter below so you don’t miss a thing. I have a big list of ideas set for future articles and other bricky things that I just have to share with you. We gathered up all of our posts on LEGO books and added them together in one spot. You will find all types of books included. We cover reading books in fiction and non-fiction as well as LEGO instruction books, how-to build type books and character and building guides. I’m sure you will find a lot to love. See them all in LEGO Books That You Won’t Want to Miss!. If you are looking for fun activities that you boys can do with all those bricks they have you should check these out! Many of the links below feature multiple activity ideas so there are more than meets the eye. Boys love to play online and here is a fun way to get them excited about making something on the computer by Making a 3D Minifig. For several years the LEGO group has made a Make a Minfig e-Card available. You can make your family into Minifigs and share it on social media. It is pretty cute. You can go see ours through that link and see if there is a current link available to make your own. L is for LEGO is a collection of ideas relating to the bricks. There are links to cool ideas that you can check out. Should you go with Duplo first? 10 Reasons Duplo is Great for Kids talks about that and other DUPLO related things. You should see the builds in this post. It is rather amazing what you can do with the bigger bricks. This is a super popular post that you need to go check out. 180+ Free Printable Coloring Pages that are perfect for young master builders and other who enjoy all of the different themes. Print some today to keep on hand for when you need to relax a bit. If you like to go to events, you will love to read these posts. The Art of the Brick is all about our trip to the exhibit by Nathan Sawaya. It was awesome and we share our views on the collection as well as some pictures we took when we were there. Looking to go to a place where everyone lives and breaths bricks? Check out our Convention and Event Guide for all of the events available to attend. We also included tips for attending so you can make sure that you and your family has a wonderful time. Our gift guide for boys page has some great brick-based gift ideas and stocking stuffers that you cannot miss! We decided to put all of our posts featuring LEGO Designs together in one spot so be sure to go check that out. Includes Holiday builds, Leprechaun Traps, robots and more. We are currently working on growing this section of our site. If you like to follow your boy’s passion and want to combine topics so that he will actually like learning about the things he needs to know, this is the spot for you. We were getting so many brick related learning ideas that we moved them to their own page. Find ideas for math, science, and much more. After you have decided on how to organize and store your LEGO, you will need to decide how you are going to sort them. See 3 Methods for Sorting which will help you decide what will work the best for you and your family. And, because some of you were curious about what we do, I wrote LEGO Organization and Storage: Our Method for Living with LEGO. It is all about how we handle the crazy amount of bricks that we have. Everyone loves to save money and when it comes to buying buckets and sets, you know you have to find good deals. We wrote two posts to cover all of what you need to know. I am sharing everything! All of my tips and trick to get the very best deals, where to shop, places you may not have thought of as well as strategies to save a whole lot of cash. How to Save Money Like a Ninja – save an new sets, brick bins and other accessories. How to Score Used Bricks and Get Them Cheap! – find out what you should pay and where to find used bricks, sets, and minifigs. It has been a while since the movie came out, but of course plenty of people are still watching the movie and enjoying it. And, good news! There is a version 2 coming in February of 2019. This post has a lot of unusual Ways Boys can Learn from the movie. Best Books for Boys: The LEGO Movie includes all of the best books and activity books from the movie. The LEGO Movie Games – sadly Warner Brothers decided to take down the games. If they update them for the new movie I will update this post. This is a series of interviews with builders. I reached out and talked to some of the top designers to ask them about growing up playing with with bricks and how boys can learn from doing the same. Pictures of their builds are included. These are really interesting to read. If your boy has a specific artist that he likes, I’m sure he will enjoy having you read these to him. If you enjoy what you see on this site and would like to hear more from me, please sign up for the newsletter. That is how I keep in touch. It is currently sent out once a week.